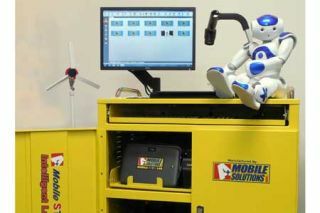 A+ Mobile Solutions officially announced today their partnership with Aldebaran NAO Robot and will be showcasing the NAO robot at ISTE Booth # 1939. Its development software is available as an optional add-on to its Mobile STEM Lab - Intelligent Laptop Cart, adding the ability to teach programming and coding to students of all ages. The NAO robot is equipped with pressure, tactile and sonar sensors, cameras and microphones to perceive its surroundings. NAO can be programmed to visually track objects, respond to touch, learn and recognize images, faces and process speech in 19 different languages. The Robot Technology Kit includes 2 NAO robots and 15 software licenses, allowing an entire class to share in the coding fun.